Writing Britain at the British Library is an extraordinary opportunity to see many of the greatest treasures of English Literature – everything from an early fifteenth century copy of The Canterbury Tales to the manuscript of Harry Potter and the Philosopher’s Stone. Best of all, whilst many of us feel a touch of post-Olympics depression, this runs until 12 September, so you’re not too late to catch it. Writing Brtain: Wastelands to Wonderlands explores the links between literature and landscape. Divided into six sections, visitors have the chance to explore writing from across the United Kingdom, and from different periods: we’re taken from an idyll of the English countryside to the harsh realities of living off the land; from the dark Satanic mills of the industrial North to visions of a New Jerusalem, suburbia and modern London, through rivers with their elemental forces, to the sublime and stirring beauty of mountains and the romantic bleakness of moorland. Visitors first encounter a section of the exhibition called ‘Rural Dreams’, which features varied works from Oscar Wilde’s The Importance of Being Earnest to Edmund Spenser’s 1579 poem The Shepheardes Calendar. I enjoyed the way that throughout the whole exhibition different literary works were juxtaposed, to create new ways of considering what we read: placing Winnie the Pooh alongside Shakespeare’s As You Like It and Thomas Gray’s ‘Elegy in a Country Churchyard‘ was striking. Throughout, there are listening stations where it’s possible to listen to writers reading their works, or sometimes actors. I was moved hearing Edward Thomas‘s wife read ‘Adelstrop‘, Thomas’ enigmatically nostalgic vision of a vanishing England, and Carol Ann Duffy reading her own poem ‘John Barleycorn’ (itself a reference to a poem by Robert Burns), a lament – a song of mourning – for the vanishing traditional English pub. From ‘Rural Dreams’ we move to ‘Industrial and Cityscapes’. For the student of Victorian Literature (anyone I’ve taught in recent years for AS English Literature!) there is much to take in – not least Gaskell’s North and South and the proofs of Dickens’ Hard Times. But this exhibition is not just about the enduring ‘classic’ works of the past. I was reminded afresh of the startling power of Tony Harrison’s hugely controversial poem ‘V’, which I vividly remember reading, aged about twelve, in The Independent (and which I’ve just discovered on You Tube) – here, the poem is placed alongside photographs of a declining and desperate Leeds in the 80s. Then, next to it, a poem which I’ve only recently discovered, ‘Belfast Confetti’, again read by the author, Ciaran Carson. Again, the juxtapositioning is inspired – for next to it is Irvine Welsh’s Trainspotting. In complete contrast, the next section takes us to a pre-industrial world or one which, perhaps more accurately, often reacts against it – the ‘Wild Places’. Here you will find Bronte’s Wuthering Heights, my favourite Robert Louis Stevenson novel Kidnapped (a work which captured my imagination like no other), Buchan’s The Thirty-Nine Steps and T.S. Elliot’s exploration of redemption The Four Quartets, with a focus on the final ‘Little Gidding’ section. Here, too, you will find the unexpected alongside the familiar: one section portrays Wordsworth’s Tintern Abbey as part of the Celtic Christian tradition of pilgrimage, wandering and retreat. Next, we reach ‘London’. More Stevenson, more Dickens, Chaucer – but here, too, Virginia Woolf and Shaw’s Pygmalion, Zadie Smith and Elliot’s The Wasteland. Then ‘Edges’ which explores suburbia. Perhaps predictably – but no less welcome – there’s John Betjamen reading ‘The Metropolitan Railway’ and that great work of Victorian satire The Diary of a Nobody. But there’s also modern suburbia, in Hanif Kureishi’s Buddha of Suburbia and Jonathan Coe’s The Rotters’ Club. Finally, we reach ‘Waterlands’. There’s a chance – just about – to read a faint handwritten draft of Matthew Arnold’s ‘Dover Beach’ and make sure you take in Philip Larkin’s reading of ‘To The Sea’. I relished the opportunity to hear Graham Swift talk of his brilliant fenland coming-of-age novel Waterland. There are literally hundreds of exhibits – I’ve touched on only a handful. For any student of English Literature, perhaps from Sixth Form and above, this is a must. It’s a chance to see the original manuscripts, letters and notebooks by many of the authors you will at some point study. Years ago, I’d seen some of the works on display, such as the Jane Austen, but never so much fascinating material together. Despite being a chip on the shoulder Celt, Scottish, Welsh and Irish Literatures were allocated a fair share of the exhibition. A whole section on London? Well, it is being presented in London, and right now the world’s focus is on the city. For me, it was nonetheless a reminder of some works I’d long forgotten about – I’m now determined to read again Lewis Grassic Gibbons’ Sunset Song, part of his Scots Quair trilogy and voted in 2005 as the Best Scottish Novel of all time – and it nudged me again to read some newer writers. I loved hearing Robert Macfarlane – whose books are on my summer reading list and about to go on holiday with me – talk about The Wind in the Willows. A few words of advice: this is a ticketed exhibition. I booked in advance but it is possible to buy tickets on the day. Select your companions carefully: if I’m honest, this will not appeal to everyone. Plenty were there on their own – there’s a lot of reading. Don’t expect an all singing, all dancing exhibition with lots of buttons to press. The curators clearly respect the intelligence of visitors. It took me about an hour and a quarter to go round. 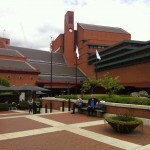 If you’ve not been to the British Library before, it’s easy to find, being almost next door to St Pancras Station and there are a number of other free exhibitions as well. 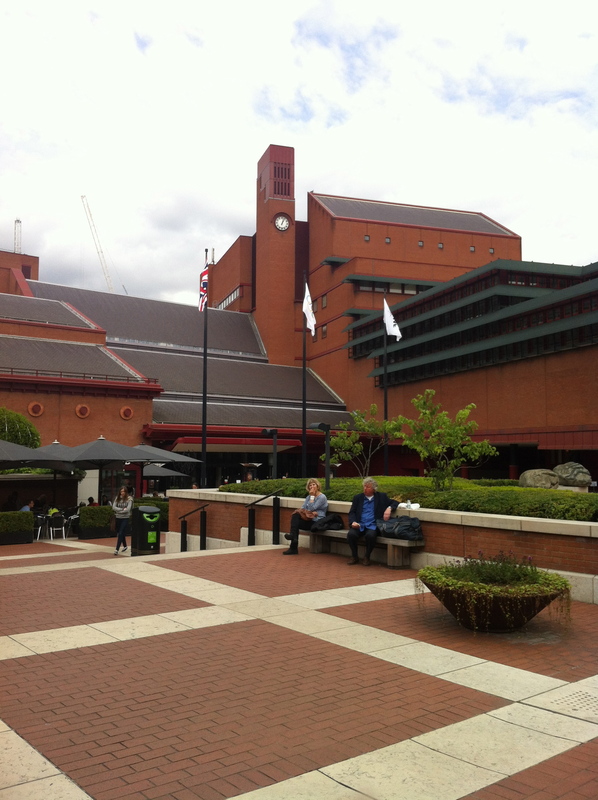 Find out more – read this blog from the curators at the British Library.